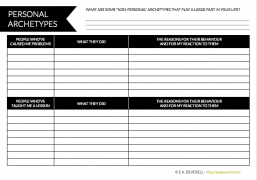 Perhaps it’s my tendency to categorisation, but I often notice that the people I meet fall into patterns, and as I accumulate experiences, I fall into patterns of responses towards them. I admit that there is a danger with categorising people that you’ll do them an injustice, and not get to know them at a deeper level. On the other hand, I think that if you keep noticing the same sorts of people entering your life, there’s a good chance that you still have more to learn from them, and categorising them can be an interesting way of recognising and exploring their role in your life. As writers, these people we know so well can in turn help us craft fictional characters who we understand better. 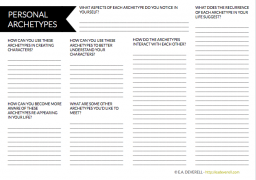 These personal archetypes represent the people we spend our lives trying to figure out in writing, probably because they emphasise our own weaknesses. What this exercise made me more aware of than anything was that there is no easy way to deal with the archetypes that you don’t like. Simply avoiding them doesn’t stop them from recurring; you clearly need to question the root cause of the problems they create. For example, ‘Friends in Need’ often appear to me as male friends who want to be partners, but they are also very present in my life in the form of my parents. While I can turn down the former, it’s very important to me to be able to meet the emotional needs of my parents, who are adorable and who I adore. So I hope you’ll approach this worksheet as a way, not simply to dwell on your problems with people, but to learn new things about yourself. The Friend in Need – These are people with whom I “click” instantly – they’re witty and have an appreciation of pop culture, and I love spending time with them. However, they also have a deep need, not just for love, but for displays of affection and devotion, which are things I feel I can’t give them. Their emotional outlook can weigh them down and make them depressed, and my efforts to “lighten them up” usually fail. The Hard Worker – these people aren’t workaholics, but they work hard because they’re passionate. They always have a revelation for me, and they’re casual and easy and I love them. The Vague-rant – these people are always vague. They have an indistinct shape in my life; sometimes they’re there, sometimes they’re not, both physically and mentally. I often feel as if it’s my responsibility to enthuse them, because they seem so jaded, or to teach them because they seem so uncertain about everything. I think they generally appreciate my efforts, but I feel frustrated because they never change anything*.